Interest expenses for investments is also an itemized deduction, but is covered in Deductibility of Investment Expenses. Under the new tax package passed by the Republicans at the end of 2017, known as the Tax Cuts and Jobs Act, a new provision that applies in 2018 and ends after 2025, limits the mortgage interest deduction to the 1st $750,000 (MFS: $375,000) of the loan. Also during this time, home equity interest will no longer be deductible unless the proceeds are used for home improvement. And because the standard deduction has been almost doubled, fewer people will be able to claim this itemized deduction. This change will mostly affect taxpayers in Blue states on the East and West Coast. Generally, interest on personal loans is not deductible, unless the loan is secured by a 1st or 2nd home, in which case, it qualifies as home equity mortgage interest. Up to $1 million of interest on home acquisition debt is deductible. Loans secured by your residence used for other purposes are called home equity loans and are deductible up to $100,000, or $50,000 for married people filing separately. The lender reports mortgage interest and deductible points of $600 or more to the IRS and to the taxpayer on Form 1098, Mortgage Interest Statement by January 31 of the following year. Late payment charges and mortgage prepayment penalties are deductible as home mortgage interest. However, prepaid interest can only be deducted in the year in which it applies. Mortgage assistance payments are not deductible nor are they taxable as income. Refunded interest is not deductible, so the deductible interest must be reduced by the amount of the refunded interest if that refund was received in the same tax year. If the refund is received in a later tax year for interest that was deducted previously, then the refund must be added as income, but only to the extent of the claimed deduction. The loan must be secured by a qualified home, either a 1st or 2nd home, and the security must be properly recorded in public records. Hence, a loan by a relative that was not properly recorded is not deductible. Likewise for unrecorded wraparound mortgages. The itemized deduction for mortgage interest is limited to 2 residences, the main residence and 1 other residence. If you have more than 2 residences, then you can pick which one to treat as a 2nd residence every tax year. A residence can also be a condominium, cooperative unit, houseboat, house trailer, mobile home, and even an RV. If a 2nd residence is rented out, then the mortgage interest can only be deducted as an itemized deduction if the taxpayer uses it for the greater of 14 days or 10% of the rental days, including days that the home was held for rental or listed for sale; otherwise, the pro rata share (= rental days ÷ total days) of the rental expenses can be deducted against rental income. If part of the home is used as a home office, then only that portion used for residential living is considered qualified. If part of the home is rented out, then that portion will still be considered a qualified home if the portion rented out is not a self-contained residential unit, and the tenant uses it primarily for residential living, and there were no more than 2 tenancies, where each tenancy can include 2 persons and their dependents, during the tax year. Additionally, to claim deductible interest, the taxpayer must actually pay the mortgage and the interest, and must either be legally liable for the mortgage or have legal title to the house. So, if you pay the mortgage for your parent, but you are not legally liable for the mortgage nor do you have any legal title to your parent's house, then you cannot deduct the mortgage interest. On the other hand, if you and your parent are co-owners and you actually pay the mortgage, then you can deduct the interest. Interest on debt secured by a home other than the primary or secondary residence may still be deductible if the loan is used for investment or business. Home acquisition loans are used to buy, construct, or improve a 1st or 2nd home, which can be any livable dwelling that has a kitchen, bathroom, and sleeping accommodations. This fairly broad definition of a home may even cover RVs and even some boats. Debt incurred to buy the interest of a spouse or ex-spouse in a home because of legal separation or divorce is treated as home acquisition debt. However, if you are subject to the alternative minimum tax, then interest can only be deducted on a 2nd home that is a traditional residence, not a boat or RV. Up to $1 million can be deducted as mortgage interest, or $500,000 if married filing separately. There is an unlimited deduction on mortgage interest if the loans were taken out before October 14, 1987. However, any such outstanding loans reduce the amount that can be borrowed subsequently. To deduct the interest on a mortgage, the mortgage must be in your name, so if you pay the mortgage for a child or parent, then you will not be able to deduct the interest unless your name is on the mortgage, even if you are paying for it. If the primary or secondary residence is destroyed, the interest on the mortgage paid after the destruction will still be deductible if, within a reasonable time, the land is sold or the home is rebuilt. If the mortgage exceeds the deductibility limits, then you must determine the deductible interest on IRS worksheets in Publication 936, Home Mortgage Interest Deduction. Married couples filing separately must deduct interest on separate residences, or if they agree in writing, then 1 spouse may claim the deduction for the primary residence and the secondary residence. For 2 or more borrowers for a given mortgage, each borrower can only deduct a pro rata share of the interest paid. If the mortgage is greater than $1 million, then the deduction is limited to the interest paid by each borrower multiplied by $1 million/average outstanding mortgage balance. In 2016, the Ninth Circuit Court of Appeals has held, and the IRS has acquiesced to the decision, that if unmarried people own a residence, then each co-owner may deduct up to the full debt limit of $1 million on a home acquisition loan and $100,000 on a home equity loan. The interest on loans used to buy stock in a cooperative apartment are generally deductible even if the stock is not used to secure the debt because of local laws or a cooperative agreement. However, a cooperative apartment owner must reduce the home mortgage interest deduction by the owner's share of any cash portion of a patronage dividend, which is a partial refund to the corporative housing corporation of some of the mortgage interest paid in a previous year. Interest on a reverse mortgage is deductible when paid, not when incurred. Interest that is offset by mortgage assistance payments, provided by §235 of the National Housing Act, are not deductible. Redeemable ground rents, which are common in Maryland, are deductible as mortgage interest if the land on which the home is located is leased, to provide a security interest for the lessor, and the lease is freely assignable, for a term exceeding 15 years, including renewals, and where the homeowner has the right, either present or future, to buy the land. However, the payment to buy the land is not deductible as mortgage interest. A mortgage credit certificate may be available in some states or localities to help finance the purchase of a principal residence. The credit is claimed on Form 8396, Mortgage Interest Credit, equal to the paid interest multiplied by the certificate rate set by the state or local government, up to a maximum of $2000. If the credit exceeds tax liability, then it can be carried forward for up to 3 years. Any interest in excess of the credit can still be claimed as an itemized deduction. So if a homeowner paid $4000 in mortgage interest and received a $1000 credit, then the remaining $3000 can still be deducted as an itemized deduction. If the home is sold within 9 years, then a proportional part of the credit must be recaptured on Form 8828, Recapture of Federal Mortgage Subsidy. the mortgage is taken out within 90 days after work is completed on building or improving a qualified home, in which case the home acquisition debt is limited to the expenses incurred beginning 24 months before the work is completed and ending on the date of the mortgage. the mortgage is taken out before work is completed on building or improving the home, in which case the home acquisition debt is limited to the expenses incurred within 24 months before the date of the mortgage. To be considered home acquisition debt, the loan must be secured by the lot or home. The loan application date can be considered the loan date if the proceeds was obtained within 30 days after approval; otherwise, the closing date of the loan is considered the loan date. Note that the above time constraints only apply to loans where the proceeds are used for something other than home acquisition costs; if the loan is actually used to pay for home acquisition costs, then these time constraints do not apply. For instance, if you get a loan to pay for home construction costs before the construction is completed, you can still deduct the interest on that portion of the loan used to pay for the completion of the construction after the loan date. Note also that if the proceeds are not used to pay home acquisition costs, and the loan date falls outside of the above time limits, then all the interest on the loan is considered nondeductible personal interest. You buy a real estate lot on November 1; construction begins in January 1 and is completed by the end of May. Costs: $100,000 for the lot, $200,000 for the construction. You use your own funds to buy the lot and to pay for the construction. You borrow $350,000 on June 15 that is secured by the new home. The interest on $300,000 is fully deductible because the loan was obtained within 90 days after the completion of construction, and because the purchase of the lot and the construction cost $300,000, that portion of the $350,000 loan is considered home acquisition debt on which the interest can be deducted. The interest on the remaining $50,000 portion of the loan is nondeductible personal interest. Interest on a home equity loan, often referred to as an home equity line of credit or HELOC, of the lesser of $100,000 ($50,000 if married filing separately) or the fair market value (FMV) of the home minus any acquisition debt is also deductible. A home equity loan is defined as a loan where the proceeds was used for something other than paying off acquisition debt or for home improvements. However, it is not deductible under the AMT tax system unless the loan is used to improve a 1st or 2nd residence. So if you have a home with an FMV of $200,000 plus outstanding acquisition debt of $120,000, and you borrow $100,000, then the interest on the $80,000 equal to your home equity is deductible under the regular tax system; the remaining $20,000 is nondeductible. Under the AMT system, the interest on the $80,000 will only be deductible if it is used to improve your primary or secondary residence. Refinancing an existing acquisition is also deductible. Although the $1 million-dollar ceiling applies to home acquisition loans, a home equity loan can even be used as an acquisition loan since it can be used for any purpose, so the $100,000 limit can be combined with the $1 million limit for a total of $1.1 million that can be applied to the purchase or improvement of a home. Additional taxes can be saved if part of the home is used for business. However, the $1.1 million limit applies to the primary and secondary residence, even if the mortgages are paid by 2 unrelated taxpayers, such as unmarried couples. A mortgage taken before October 14, 1987, or any refinancing of that mortgage, will generally qualify as grandfathered debt. The proceeds of such debt can be used for any purpose and there is no limit on the amount of interest that can be deducted on such debt. However, grandfathered debt does lower the $1 million limit on home acquisition debt and the $100,000 limit on home-equity debt by the amount of the remaining grandfathered debt. Although grandfathered debt can be refinanced, its treatment as grandfathered debt is limited to the term of the original mortgage, which cannot exceed 30 years. After the original term ends, any remaining interest is deductible as home acquistion or home equity debt, depending on how the proceeds were used. Mortgage insurance premiums for insurance contracts issued after 2006 — but not mortgage fees, such as loan assumption fees, real estate appraisal fees, or credit report fees — on homes are deductible as interest, at least until 2016. The Bipartisan Budget Act, enacted on Feb. 9, 2018, has extended, for tax year 2017 only, the deductibility of mortgage insurance premiums as interest. Prepayment penalties are deductible as home mortgage interest if they are not for specific services. Any interest in excess of a mortgage credit is also deductible. Prepaid mortgage insurance premiums can be allocated over the lesser of the mortgage term or 84 months after the insurance is purchased. This deduction is lost however if the mortgage is paid before the end of its term. However, there is an adjusted gross income (AGI) phaseout amount, which reduces the deductible amount by 10% for every $1000 or part thereof ($500 or part thereof, if married filing separately) of AGI exceeding $100,000 ($50,000: married filing separately). The deduction is completely eliminated when AGI exceeds $109,000 ($54,500: married filing separately). Qualified mortgage insurance includes mortgages insured by the Department of Veterans Affairs, the Federal Housing Administration, and any private mortgage insurance that satisfies the Homeowners Protection Act. For graduated payment mortgages, only the interest that is actually paid is deductible, but accrual basis taxpayers may deduct the accrued interest each year. Interest on reverse mortgage loans is deductible only when they are actually paid, not when they are added to the principal. This occurs usually when the home is sold or the homeowner dies. This deduction is subject to the limit on home equity loans. The mortgage insurance premiums that were paid for the year are reported by the lender on Form 1098, Mortgage Interest Statement. Case 1: You buy a house in May 2015, using a 15 year mortgage, and paying $8400 in points. Because 15 years exceeds 84 months, the points must be amortized over the 84-month period. Assuming that your AGI does not exceed $100,000, you can deduct $800 (= $8400 ÷ 84 × 8 months = $100 per month × 8). Over the next 6 years, assuming that your income remains below $100,000, you can deduct $1200 (= $100 × 12 months). In the 8th year, you can deduct $400, since there are only 4 months left in the last year of the amortization period. Case 2: Case 1, but mortgage term = 5 years = 60 months. Then the deduction is calculated as in Case 1, but the monthly deduction = $8400 ÷ 60 = $140. Case 3: Case 1, but AGI = 105,100. The deduction must be reduced by 60% (50% due to the $5,000 overage plus 10% for the $100), so only 40% of the deduction, or $40 can be claimed for each month of the amortization period. Case 4: Case 3, but married filing separately. No deduction, since AGI > $54,500. are paid directly by the borrower to the lender. Otherwise, the points must be deducted over the life of the loan (amortized). Points paid by the seller are deductible by the buyer, but they reduce the cost basis of the home for the buyer (IRS Revenue Procedure 94-27). Deductible points are reported by the lender on Form 1098, Mortgage Interest Statement. The points on a 2nd home or vacation home must be deducted ratably over the loan term. There is no current deduction for the points paid on a refinanced mortgage. The balance of the points is deductible if the mortgage ends because of a payoff or foreclosure. The payment of points must be an established business practice for your area. The points assessment must be reasonable to what is traditionally charged in your area. Points cannot cover what would ordinarily be separately stated on the settlement sheet. The points charged must be fully paid by you or the seller, although some of the loan proceeds can be used to pay for the points. The loan proceeds must be used either to improve your home or to buy or build your main home. 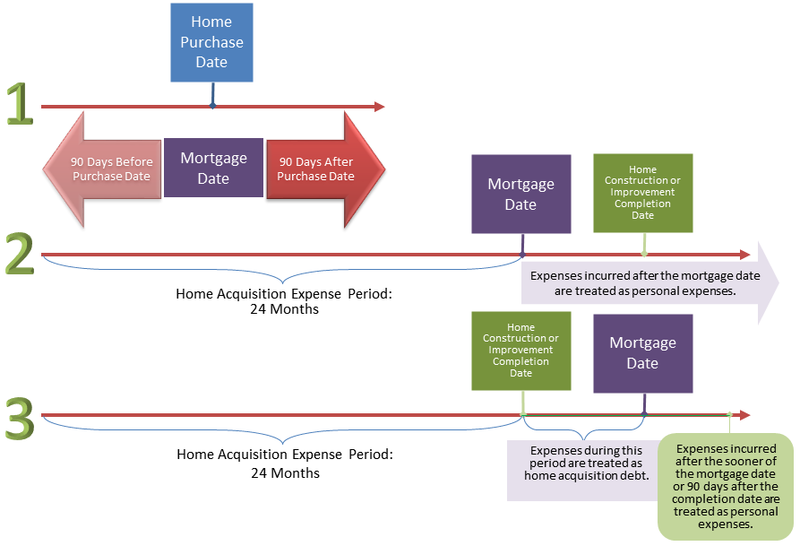 If the loan was used to buy or build your main home, then the points must be computed as a percentage of the mortgage amount and the settlement statement must clearly show that the amount paid was for points. Points on an additional mortgage used to finance improvements to your principal residence are immediately deductible, subject to the $1 million and $100,000 limits, but only if the refinancing costs, including points, is not rolled over into the new loan; otherwise, the rolled-over refinancing costs must be amortized over the life of the loan. Points paid to refinance debt not used to improve a primary residence can only be deducted ratably over the life of the loan. If a loan with unamortized points (points that were not deducted) is refinanced, then those points can be deducted in the year that the loan is refinanced if you use a different lender from that of the previous loan. If the same lender is used, then the unamortized points must be deducted ratably over the life of the new loan. Refinance loans for home acquisition costs are still fully deductible. If any portion of the refinanced loan is used for purposes other than buying, building, or improving a 1st or 2nd home, then it is considered a home equity loan ratably subject to the $100,000 limit. If the loan proceeds are used for both purposes, then the overall limit is $1.1 million ($550,000 for married filing separately). Any amount over that is considered nondeductible personal interest. Deductible points on the refinanced mortgage must be allocated ratably over the term of the loan. So if the taxpayer paid $2,000 for points for refinancing over a 10 year period, then only $200 is deductible per year. However, if the loan is paid off early, then the remaining points can be deducted in the year of the payoff. If part of the refinanced loan is used for home improvements, then the points allocable to the home improvement are deductible when the loan is acquired or when the points are paid. Example: In September, you borrow $100,000 with a term of 10 years to pay off a mortgage with a balance of $60,000; the remaining $40,000 is used for home improvements. You paid $3000 in points as prepaid interest. Therefore, 40% of the paid points, or $1200, are allocated to the home improvements and are immediately deductible; the remaining $1800 is allocated to the refinanced mortgage, which must be deducted ratably over the 10-year loan period, where the deduction for each month is equal to $1800 ÷120 = $15. Therefore, in the 1st year, you can deduct $15 × 3, the number of remaining months of the year when the loan was acquired + $1200 of points allocated to the home improvement portion = $45 + $1200 = $1245. Thereafter, 12 × $15 = $180 can be deducted each year during the term of the loan, except for the last year, when 9 × $15 = $135 can be deducted. obtain legal title by paying the balance of the purchase price. Married couples filing separately can only claim $500,000 of home acquisition indebtedness and $50,000 of home equity indebtedness per spouse. If one spouse pays all the interest, then the $550,000 limit applies rather than the $1,100,000 limit. However, according to a recent tax memorandum, payment of the mortgage from a joint account where the joint account holder also owns the property jointly and equally is presumed to pay an equal amount of interest, so each can deduct their share of the mortgage interest. However, the limit of $1 million of acquisition indebtedness and $100,000 for home equity loans applies to each residence rather than to each taxpayer. So if there are multiple owners of the property and they are all paying the mortgage, then the deductible interest limit is still $1,100,000.